Fruit stall in Barcelona, Spain. The term fruit has different meanings depending on context. In botany, a fruit is the ripened ovary—together with seeds—of a flowering plant. In many species, the fruit incorporates the ripened ovary and surrounding tissues. Fruits are the means by which flowering plants disseminate seeds. In cuisine, when discussing fruit as food, the term usually refers to just those plant fruits that are sweet and fleshy, examples of which include plum, apple and orange. 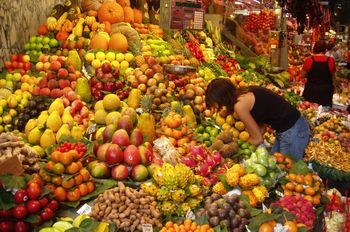 However, a great many common vegetables, as well as nuts and grains, are the fruit of the plant species they come from. No one terminology really fits the enormous variety that is found among plant fruits. Botanical terminology for fruits is inexact and will remain so. The term false fruit (pseudocarp, accessory fruit) is sometimes applied to a fruit like the fig (a multiple-accessory fruit; see below) or to a plant structure that resembles a fruit but is not derived from a flower or flowers. Some gymnosperms, such as yew, have fleshy arils that resemble fruits and some junipers have berry-like, fleshy cones. The term "fruit" has also been inaccurately applied to the seed-containing female cones of many conifers. With most fruits pollination is a vital part of fruit culture, and the lack of knowledge of pollinators and pollenizers can contribute to poor crops or poor quality crops. In a few species, the fruit may develop in the absence of pollination/fertilization, a process known as parthenocarpy. Such fruits are seedless. A plant that does not produce fruit is known as acarpous, meaning "without fruit". 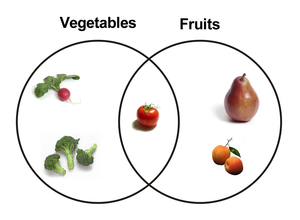 Venn diagram representing the relationship between botanical and culinary fruit and vegetables. Many culinary vegetables are botanical fruit. 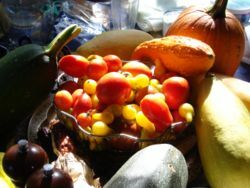 An arrangement of fruits commonly thought of as vegetables, including tomatoes and various squash. Many foods are botanically fruit but are treated as vegetables in cooking. These include cucurbits (e.g., squash, pumpkin, and cucumber), tomato, aubergine (eggplant), and sweet pepper, spices, such as allspice and chillies. Occasionally, though rarely, a culinary "fruit" will not be a true fruit in the botanical sense. For example, rhubarb may be considered a fruit, though only the astringent petiole is edible. In the commercial world, European Union rules define carrot as a fruit for the purposes of measuring the proportion of "fruit" contained in carrot jam. In the culinary sense, a fruit is usually any sweet tasting plant product associated with seed(s), a vegetable is any savoury or less sweet plant product, and a nut any hard, oily, and shelled plant product. Although a nut is a type of fruit, it is also a popular term for edible seeds, such as peanut (which is actually a legume), pistachio and walnut. Technically, a cereal grain is a fruit termed a caryopsis. However, the fruit wall is very thin and fused to the seed coat so almost all of the edible grain is actually a seed. Therefore, cereal grains, such as corn, wheat and rice are better considered edible seeds, although some references list them as fruits. Edible gymnosperms seeds are often misleadingly given fruit names, e.g. pine nuts, ginkgo nuts, and juniper berries. A fruit is a ripened ovary. After the ovule in an ovary is fertilized in a process known as pollination, the ovary begins to ripen. The ovule develops into a seed and the ovary wall pericarp may become fleshy (as in berries or drupes), or form a hard outer covering (as in nuts). In some cases, the sepals, petals and/or stamens and style of the flower fall off. Fruit development continues until the seeds have matured. With some multiseeded fruits the extent to which the flesh develops is proportional to the number of fertilized ovules. The wall of the fruit, developed from the ovary wall of the flower, is called the pericarp. The pericarp is often differentiated into two or three distinct layers called the exocarp (outer layer - also called epicarp), mesocarp (middle layer), and endocarp (inner layer). In some fruits, especially simple fruits derived from an inferior ovary, other parts of the flower (such as the floral tube, including the petals, sepals, and stamens), fuse with the ovary and ripen with it. The plant hormone Ethylene causes ripening. When such other floral parts are a significant part of the fruit, it is called an accessory fruit. Since other parts of the flower may contribute to the structure of the fruit, it is important to study flower structure to understand how a particular fruit forms. Fruits are so varied in form and development, that it is difficult to devise a classification scheme that includes all known fruits. It will also be seen that many common terms for seeds and fruit are incorrectly applied, a fact that complicates understanding of the terminology. Seeds are ripened ovules; fruits are the ripened ovaries or carpels that contain the seeds. To these two basic definitions can be added the clarification that in botanical terminology, a nut is a type of fruit and not another term for seed. 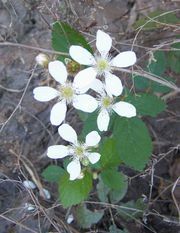 Dewberry flowers. Note the multiple pistils, each of which will produce a druplet. Each flower will become a blackberry-like aggregate fruit. Sweet gum, multiple of capsules. Sycamore and teasel, multiple of achenes. Seedlessness is an important feature of some fruits of commerce. Commercial cultivars of bananas and pineapples are examples of seedless fruits. Some cultivars of citrus fruits (especially navel oranges and mandarin oranges), table grapes, grapefruit, and watermelons are valued for their seedlessness. In some species, seedlessness is the result of parthenocarpy, where fruits set without fertilization. Parthenocarpic fruit set may or may not require pollination. Most seedless citrus fruits require a pollination stimulus; bananas and pineapples do not. Seedlessness in table grapes results from the abortion of the embryonic plant that is produced by fertilization, a phenomenon known as stenospermocarpy which requires normal pollination and fertilization. Many hundreds of fruits, including fleshy fruits like apple, peach, pear, kiwifruit, watermelon and mango are commercially valuable as human food, eaten both fresh and as jams, marmalade and other preserves. Fruits are also found commonly in such manufactured foods as cookies, muffins, yoghurt, ice cream, cakes, and many more. Many fruits are used to make beverages, such as fruit juices (orange juice, apple juice, grape juice, etc) or alcoholic beverages, such as wine or brandy. Many vegetables are botanical fruits, including tomato, bell pepper, eggplant, okra, squash, pumpkin, green bean, cucumber and zucchini. Olive fruit is pressed for olive oil. Apples are often used to make vinegar. The spices vanilla, paprika, allspice and black pepper are made from fruits. Fruits of opium poppy are the source of the drugs opium and morphine. Osage orange fruits are used to repel cockroaches. Bayberry fruits provide a wax often used to make candles. Many fruits provide natural dyes, e.g. walnut, sumac, cherry and mulberry. Dried gourds are used as decorations, water jugs, bird houses, musical instruments, cups and dishes. Pumpkins are carved into Jack-o'-lanterns for Halloween. The spiny fruit of burdock or cocklebur were the inspiration for the invention of Velcro.